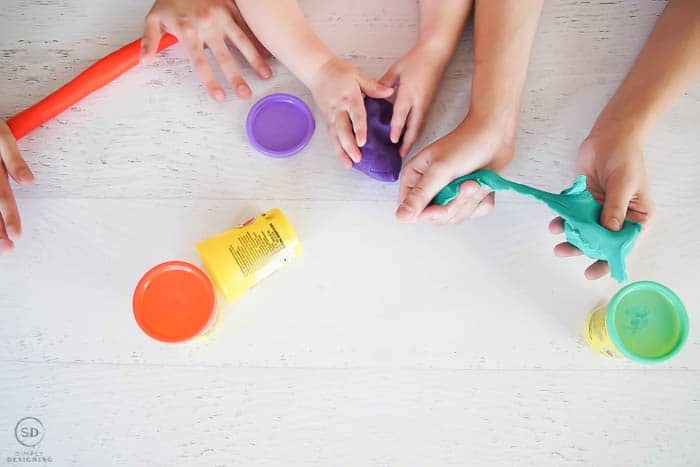 Whether you are looking for fun summer activities, fall break ideas or just something to keep your toddler busy on a Tuesday, today I am chatting about the Best Sensory Sand for Sensory Play! We love to incorporate sensory play into our day after my kids complete their Chore Chart (go HERE to check out my free download). But it is always hard knowing which one is best. So I took four different popular sands, doughs and other squishy sensory toys and put them up the real test: kids! And here are the results: real, true and straight from the mouth of my kiddos. 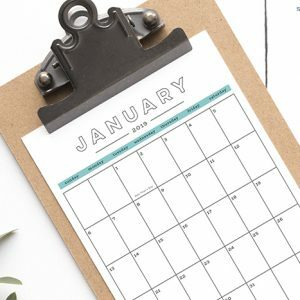 Ready to check this out? Let’s go! A big thank you to Spin Master for sponsoring this post. All opinions, thoughts, ideas and images are mine and the children’s ratings are unbiased. 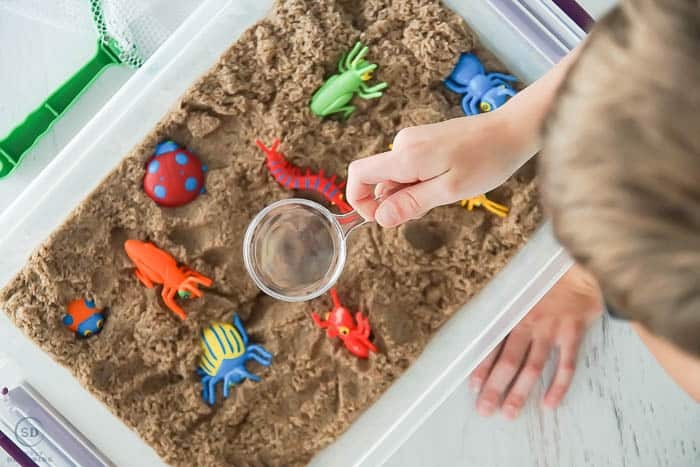 We recently used Kinetic Sand to make a really fun DIY Insect Sensory Bin (check it out HERE) and we loved how the sand felt and I loved how it wasn’t too messy! But I wanted to see how other, similar items, stacked up against each other. So I headed out to the store and bought a few different options for my kids to test. 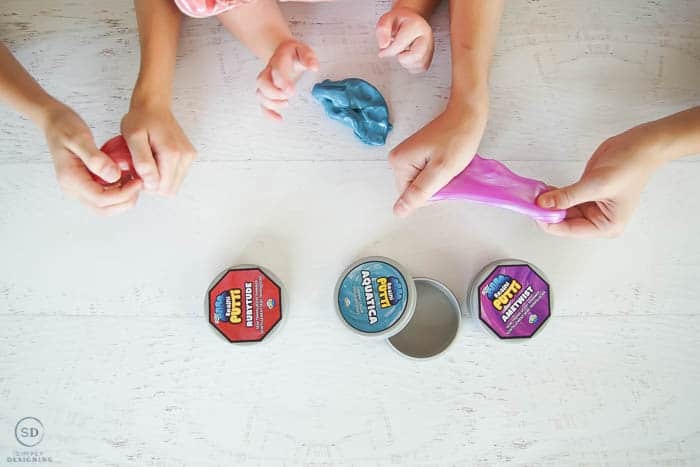 We tested Kinetic Sand, Play-Doh, Slime and Putti and I asked my children for their ratings in certain areas. My three children all had so much fun doing this! My bigger kids told me their scores independently, and then I paid attention to how my littlest one interacted with the item and scored that one myself. Believe me, my little one was very expressive and verbal about how she liked each of these items. It was pretty cute. I averaged the scores together for an overall ranking. 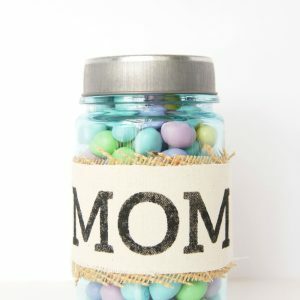 But I also asked my kids to rank the items in order of their favorite too. Their favorite picks and the rankings were consistent and the winner is clear. I made cute little charts to share all the rankings with you today and I couldn’t be more excited about it. So here it is, a Kinetic Sand throwdown…how did they all stack up? Let’s see. My kids like slime, but honestly, I don’t. It is so messy in my opinion, but I wanted to let my kids test this out alongside everything else to see what they really thought of it when put up against other options. I couldn’t believe it, but Slime actually ranked last according to my kids! 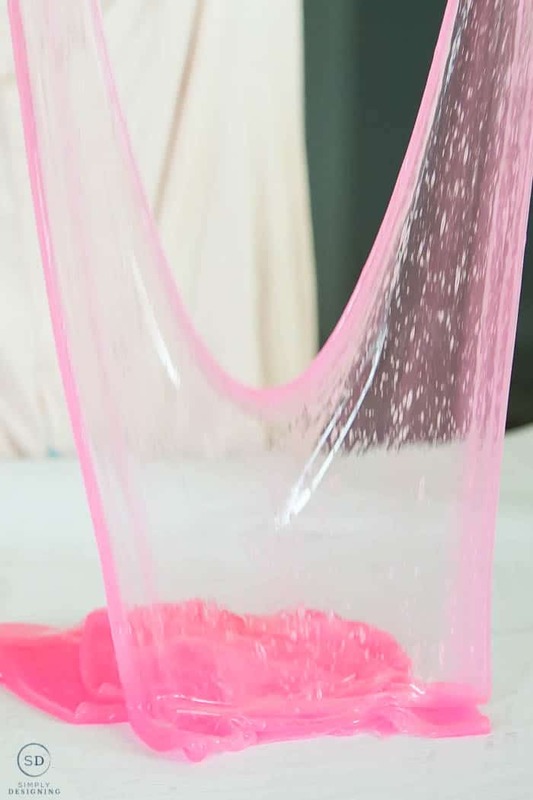 A few notes about these scores, the Slime was in fact super messy. Yuck. My littlest one would poke it, but didn’t like it when it stuck to her hand. It wasn’t as messy for my big though. 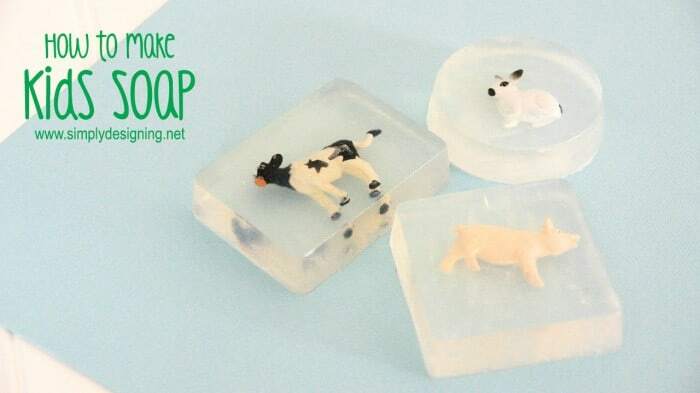 As far as creativity goes, there really isn’t much you can do with slime. Although my daughter did enjoy stretching it for a bit. But there just wasn’t much else that could be done with it since it doesn’t mold or hold a shape. So it didn’t hold their interest for very long and ended up getting the lowest scores by far. Slime ranked #4 in our house. 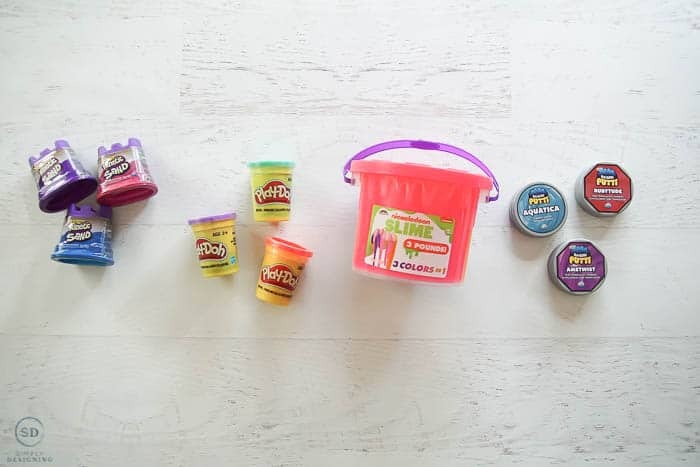 Play-Doh is an old stand-by, but I have never been a fan of the messiness of this one either. My kids have always enjoyed it so I wanted to see how they liked it compared to the other options. A few notes about the scores. Play-Doh is still pretty messy. I had it all over my floors in itty bitty tiny pieces. My littlest one did not like this very much and she didn’t seem to like how it felt at all, so it was not a huge hit with her and she lost interest very quickly. Overall this scored quite a bit higher than slime, but it still came in at #3 in our house. Putti…my kids are obsessed with it. But I wasn’t so sure about it. So I decided to give it a fair chance, buy some and see how it really stacked up against our competitors. Wow you guys! Putti ranked really high with all my kids. My youngest liked it but asked for “help”, while my older two had fun shaping it and bouncing it. And while in the past I have claimed it is messy, it wasn’t nearly as bad as some of its competitors, so that’s always a mom win. Overall this scored really well, but it still came in at #2 in our house. Although it was pretty tight in the end, Kinetic Sand ended up with the best overall ratings in our house! 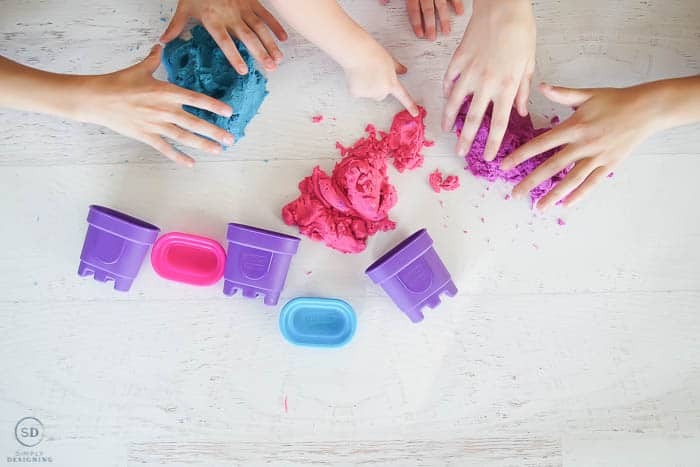 Some thoughts on Kinetic Sand: While it initially seemed a little bit messier than Putti, it actually held all of my children’s interest the longest, even including my littlest one. Putti, it actually held all of my children’s interest the longest, including my littlest one. She loved to try to mold it and all of the kids loved how this felt in their hands. And when it came time to clean up, it was actually a breeze to clean! My kids are more likely to stay put and play with Kinetic Sand at the table so they can enjoy molding and shaping it. Whereas with putti, I found them taking it all over the house and putti all over the house means putti in my carpet. 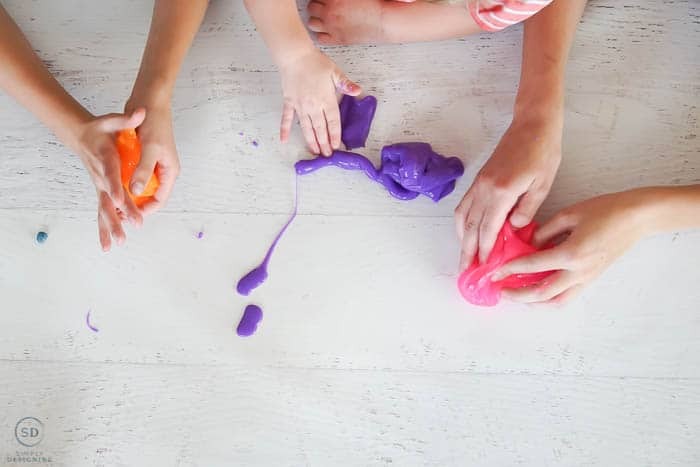 But wherever you take Kinetic sand, it sticks to itself, not my kids, or my kitchen table and is super easy to clean up which is a mom-win in my book. 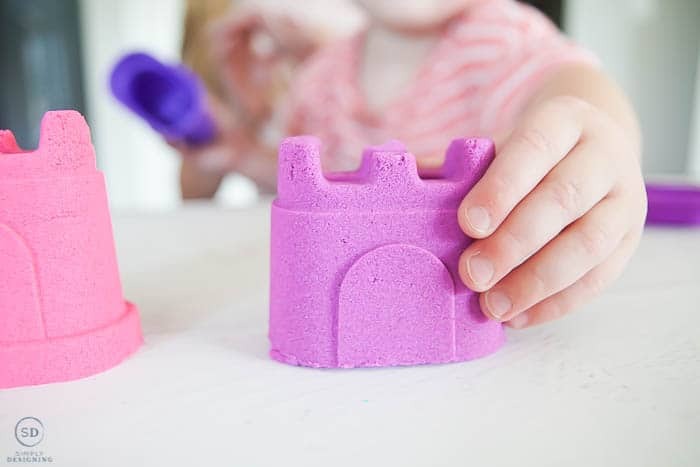 When it came down to it, Kinetic Sand got the best rankings and scored #1 in our house! Wahoo! 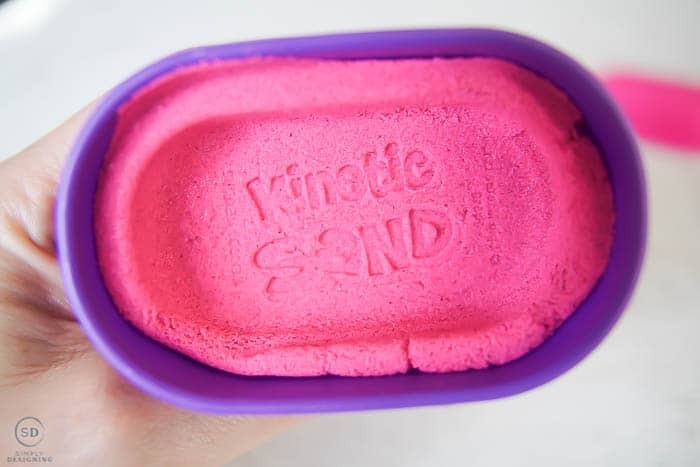 The best thing about Kinetic Sand is that it will hold a shape, and is also the perfect filling to use to build a sensory box! (Check out my DIY Sensory Bin HERE). It’s 98% sand and 2% magic, and I believe it! Even I find myself touching and playing with it. Kinetic Sand sticks to itself and not to my kids. It stretches, squeezes and still keeps its shape when pushed together And did I mention it is gluten, casein and wheat free? So it is safe for kiddos with those types of allergies to play with!